FAO Director-General José Graziano da Silva today witnessed the positive results of FAO's Typhoon Haiyan response programme and committed FAO to supporting the recovery of fishing and farming livelihoods in the longer term. Graziano da Silva travelled together with Secretary Proceso Alcala of the Philippine Department of Agriculture (DA) and the Philippine Permanent Representative to FAO, Ambassador Virgilio Reyes, to Basey, a municipality of Samar province, in the Eastern Visayas. Meeting with affected farmers and fishers, he handed over bags of fertilizer and tools and ate lunch with farmers supported by FAO. Making landfall four months ago, Typhoon Haiyan (locally known as Yolanda) claimed over 6 200 lives, displaced millions and devastated the agriculture and fisheries sectors. Striking between two planting seasons, the typhoon destroyed ready-to-harvest, harvested and newly planted rice crops, wiping out whole coastal communities and damaging or destroying some 33 million coconut trees. In the weeks immediately following the typhoon, FAO responded to an official Government request for support to affected rice farmers, providing 75 percent of the Government-requested rice seeds. Thanks to a coordinated response by FAO, the Government and partners, farmers who would otherwise have been unable to plant in time for the December/January planting season were able to go back to their fields, and will soon be harvesting the first rice crop since the typhoon hit the country. 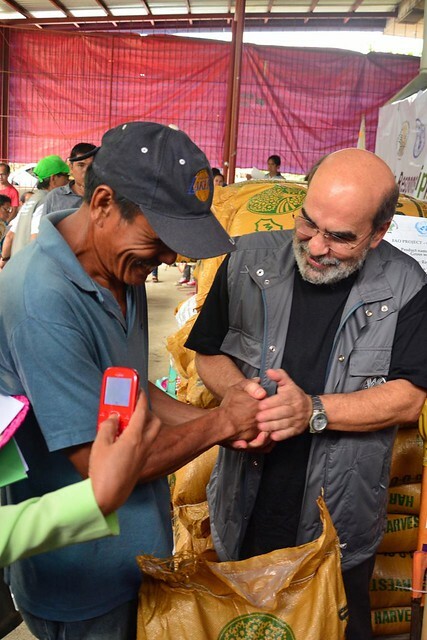 Graziano da Silva visited flourishing rice fields planted with FAO rice seed and was thanked by Alcala for FAO's timely response and support to the Government, which enabled 44,000 farming families to restore their livelihoods by securing what would otherwise have been a lost harvest. To bolster FAO's, the government's and partners' rice seed distributions, FAO is distributing 4,000 tonnes of fertilizer to more than 80,000 families along with 13,000 farming tools which ensures planted rice seed can reach full production potential and produce an optimum yield, which, in turn, ensures food security and a full recovery. Graziano da Silva and Alcala personally handed over bags of fertilizer and hand tools to Ricardo Gula and Wilma Regala, two farmers supported by FAO from Barangay Canabay in Basey, Samar, some thirty minutes away from Tacloban. Asked by Graziano da Silva about the quality and quantity of the expected harvest, Ricardo Gula expressed his appreciation for FAO's support and said he was confident the high-yielding certified rice seeds' production would help his family to recover from the damage caused by the typhoon. "Once harvested in March/April of this year, the quality certified rice seed is expected to yield enough to feed around 800,000 people for more than a year. Our rapid response cost around $5 million and will yield $84 million in rice, providing real value for money to donors" said Graziano da Silva. The typhoon devastated the agriculture sector with losses of around 1.1 million tonnes of crops and 33 million coconut trees damaged or destroyed. "Providing coconut farmers with alternative livelihoods while their newly replanted coconut trees become fully productive is a top FAO priority," Graziano da Silva emphasized. FAO is supporting these coconut farmers through livelihood diversification and land use intensification through intercropping and livestock rearing, which will give them access to vital income and productive capacity during the 6-8 years it will take for their trees to become fully productive again. With up to 400,000 fisherfolk impacted and an estimated 30,000 fishing vessels damaged or destroyed, the fisheries sector was one of the most severely affected. Estelita Taboy, representing one of the fishing communities in Basey, thanked FAO for the support received so far and added that "although the government has helped us to rebuild our boats, we still need fishing inputs, such as nets, hooks and cages that were all destroyed by the typhoon." "Supporting the recovery of fishing communities through boat rebuilding and the provision of key fishing inputs is another top priority," said Graziano da Silva. Over lunch with farmers and fishers, he listened to their testimony on how they benefitted from FAO and the government's collaborative efforts and lauded the Filipinos' positive attitude in the face of recurring disasters. "We are committed to ensure that affected populations can build resilience to future disasters and make sure that when the next typhoon hits, they are able to build back better and safer," he added. Thanks to the generous donations of the governments of Belgium, Ireland, Italy, Norway and Switzerland FAO has to date mobilized $11.7 million as part of its component of the UN's Strategic Response Plan, around 31 percent of the $38 million that it appealed for as part of it's response programme. Ongoing discussions with donors have resulted in total committed funds of more than $30 million. With these funds FAO aims to support 138,000 of the most affected farming and fishing households in the Philippines. FAO continues to advocate for urgent support to affected farmers and fishers and has received confirmation from several donors for significant additional funding that will enable it to deliver an effective and well funded response.